Alaska Peninsula brown bears are a very large brown bear subspecies, usually ranging in weight from 800 to 1,200 pounds (363 to 544 kg). They are found in high densities along the southern Alaskan coast due not only to the large amount of clams and sedge grass but also to the annual salmon runs; this allows them to attain huge sizes, some of the biggest in the world. They may gather in large numbers at feeding sites, such as Brooks Falls and McNeil Falls, both in Katmai National Park near King Salmon. There is debate as to if Alaska Peninsula brown bears should be referred to as "grizzlies" along with all other North American subspecies of the brown bear. There is confusion experienced when referring to inland and coastal ones separately, but biologists still maintain that coastal ones are truly brown bears. However, it is considered correct to place all North American members of U. arctos in the subspecies horribilis except the giant Kodiak bears of Kodiak Island. To avoid confusion, many simply refer to all North American members, including Kodiaks, as "grizzly bears." Prized by hunters for their skulls and hides, up to 500 of Alaska's 1,500 brown bears killed yearly by hunters come from the Alaska Peninsula. To hunt this large bear, hunters must follow a variety of regulations, including bear bag limits, hunting fees and proper rifles. 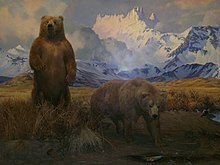 The Alaska Peninsula brown bear's name most likely arose because, until 1975, they were considered a different species from the inland grizzly bear. They were never considered closer to European brown bears than inland grizzlies, but were given a different name, due to the size and color differences of coastal browns and inland grizzlies. From 1975 onward, they were considered to be the same species, but coastal ones retained the name "brown bear." Alaska Peninsula brown bears are the second largest type of brown bear in the world, only after the giant bears of Kodiak Island. They usually measure 8 feet (2.4 m) in length, usually have a shoulder height of about 4-4-1/2 feet (1.2-1.4 m), and a hindfoot length of 11 in (28 cm). One study found that the average weight for a coastal male was around 408 kilograms (900 lb). For a female, this average weight would be 227 kilograms (500 lb). On the other hand, an occasional huge male brown has been recorded which greatly exceeds ordinary size, with weights reported up to 680 kg (1,500 lb). A large coastal male of this size may stand up to 3 metres (9.8 ft) tall on its hind legs and be up to 1.5 metres (4.9 ft) at the shoulder. The biggest individual on record was shot in 1948 near Cold Bay. Its weight was estimated at 725 kg (1,598 lb) to 771 kg (1,700 lb). This bear just came out of hibernation and carried little or no fat; that means the animal would have weighed around 839 kg (1,850 lb) at the end of the summer. Although variable from blonde to nearly black, grizzly bear fur is typically brown in color with white tips. 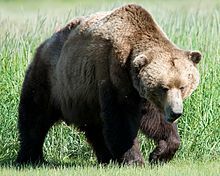 A pronounced hump appears on their shoulders; the hump is a good way to distinguish a black bear from a grizzly bear, as black bears do not have this hump. Brown bear in Katmai National Park with salmon. Salmon make up the majority of the brown bear's diet during spring. Brown bears on the Alaskan Peninsula usually feed on spawning salmon, and use many different ways to catch them. These include waiting at the bottom of the falls for the fish to jump, or standing at the top of the falls waiting to catch the fish in midair (sometimes in their mouths). Bears also have much experience at chasing fish around and pinning the slippery animals with their claws. After the salmon runs, berries and grass make the mainstay of the bears' diets, after which they put on sufficient fat reserves and go into hibernation. ^ McLellan, B. N.; Servheen, C. & Huber, D. (2008). "Ursus arctos". IUCN Red List of Threatened Species. Version 2013.1. International Union for Conservation of Nature. Retrieved 2013-10-05. ^ a b "Ursus arctos gyas Merriam, 1902". ITIS. ^ "Brown Bear". Alaska Department of Fish and Game. ^ Burt. Henry W. (1952) A Field Guide to the Mammals. p. 42. ^ Whitaker, John O. (1980). The Audubon Society Field Guide to North American Mammals. ISBN 0-394-50762-2. ^ "Mammalian Species- Ursus arctos" (PDF). American Society of Mammalogists, Smith College. Archived from the original (PDF) on 2016-03-04. Retrieved 2012-06-14. ^ a b "Brown or Grizzly Bear". North American Bear Center. ^ "Grizzly Bear". National Wildlife Federation. ^ "Brown Bear Research in Alaska". ADFG. ^ "Brown Bear". Bear Trust International. ^ "Kodiak Bear Fact Sheet". Alaska Department of Fish and Game. Retrieved 2008-10-27. ^ Animal facts and feats. New York : Sterling Pub. Co. 1977. ^ Species Profile: Grizzly bear (Ursus arctos horribilis). U.S. Fish and Wildlife Service. Ecos.fws.gov. Retrieved on 2012-08-17. Wikimedia Commons has media related to Ursus arctos horribilis. This page was last edited on 5 March 2019, at 19:29 (UTC).